अनाज का धर्म, सत्य धर्मं की विडम्बना मात्र है । आज यदि किसी चीज को अत्याधिक आवश्यकता है तो वह है चारिव्य की । जिनका जीवन यज्ञाम्रिडित तथा उज्वल प्रेम से भरा हुआ है उठी की आवश्यकता आज पग - पग पर अनुभव होती है । उनका प्रत्येक प्रेममय शब्द बज की भाँति काम कोमा । आपमें पूरे विश्व को हिलने का सुम सामव्यं है । इसमें कोई अतिरंजिंतता नहीं है । आप जैसे ही अन्य लोग आगे आयेंगे । आज हमें धैयंधूर्ण शब्द एवं धैर्यपूर्ण कृति की आवश्यकता है । अाप जागो ! जागो ! जब विश्व दु८ख से पीडित है तो कया अमर सुख से सो सकेगी ? इसी तरह से हम दोनों बार- बार आह्नग्रन वरेंगे । कब तक, जब तक सब आराध्य जागृत नहीं होंगे तथा हरेक के अन्दर का ईंश्वरतल्व जादृग्रत नहीं होगा तब तक । इसके अतिरिक्त जीवन में करने जैसा अन्य कुल भी नहीं है । इससे श्रेष्ठतर और कुछ भी नहीं है । परब बाते अपने आप आ जायेंगी । उसके लिये मुझे कुल सोचने को अनावश्यकता नहीं है । योजना अपने आप विकसित होकर नियोजित कार्य अपने आप सेम्यन्न हो जाते हैं । मैं केवल आवाहन करता हूँ जागो ! Nivedita was initiated into Hindu Dharma but the process to be initiated in the service and worship of Mother India was a prolonged one and even painful. The name was changed but the disciple needed to inculcate the spirit of India. Every morning along with few other monks Swamiji visited the three women – Josephine Macleod, Mrs Bull and Sister Nivedita who were then staying in one old cottage near Belur. Either in a verandah or under a tree he talked to them about various things, The central theme was always India. A new aspect of the Swami's personality was revealed to his disciples here. In West, 'he was a religious teacher wrapped in sunlit serenity and peace'. However, here he was 'the lover of his land, the Defender of his faith, impatient and restless, 'like a lion caught in a net'. Once Josephine Macleod asked him, "What shall we do for you?' He said, "Love India! Love her as she is!" Those were not just some classes but Swamiji was training his disciple Nivedita to the life she was going to lead in India. She had a tough training ahead. Some days after the consecration ceremony along with some monks of Ramakrishna Mission and Nivedita and other disciples from West Swamiji set out on pilgrimage. It was a pilgrimage to understand India. What confidence Swamiji must be having in inherent strength and beauty of India that even in those days of slavery and degradation he dared to take his foreign disciples to see and understand India. Nivedita observed that Swamiji looked at his country with the eyes of an artist and a poet and with the sensibility of a mystic. He pointed out that every separate theme of life in India is like a unique prayer of the soul. How true was the remark, which Swami Vivekananda had made in London, 'I loved India before I came away; now the very dust of India has become holy to me, the very air is holy to me now…' But for Nivedita it was still very difficult to understand. While living in England, like most of the English people, Nivedita thought that the British rule was beneficial to India. She thought that if both England and India would be able to love each other, it would do good to both the countries. Even after her coming to India, she initially maintained that stand. Swamiji had already made it clear to her that the service for which he had called her was not his own, but of Truth itself. However, Nivedita never dreamt that dedicated service implied complete forgetting of one's old self. She was learning to know and adore India, but that did not diminish her loyalty towards the Britain. She was British to the core of her being, proud of her race, its deeds and its history. So, the day after her initiation, when Swamiji asked Nivedita, 'To which nation do you belong?' Nivedita proudly declared her loyalty to the British flag. Swamiji realized how deep were the western tendencies and ideas in Nivedita's mind. He realized that his disciple's love for his country was only superficial and until she identifies herself with India and her people, she cannot render service to India in real sense. Thus, a very difficult period of training began in the life of Nivedita. Margaret entered with her two Western companions bit nervous. She wondered how would now they talk to Sri Ma as they did not know Bengali. But, as time passed they realized the Mother knew the language of heart and no other language was required. Though both could not understand each other's language, Mother welcomed her by giving Margaret Sweets with her own hand and then ate with Margaret and other foreign disciples of Swamiji who had come on visit. Sri Ma enquired kindly about them and then looked at Margaret for a long moment and said, 'My daughter, I am glad you came.' This phrase of welcome of acceptance became the talk of the neigbourhood. The women said over and over to one another, 'Mother called her 'My Daughter', just like the rest of us'. 'The Holy Mother's partaking of food with the foreign ladies had a deeper implication. It was a sanction given by her to accept and absorb these Western devotees within the folds of Hindu Society. Swami Vivekananda was overjoyed when he came to know that Mother fed Margaret with her own hands. He felt if Mother has accepted her then everything would turn out properly. Margaret wrote later, "A tremendous dynamic power emanated from Sarada Devi, while she remained completely absorbed within herself. She touched upon the very heart of life." The third important event was on March 25 the day of consecration of Margaret. Swami Vivekananda initiated Margaret into Hindu Dharma. What a historic event it was! Margaret was taken to the shrine and then Swamiji taught her how to offer pooja to Siva, She was given the vows of Brahmacharini and was given the name Nivedita – the dedicated. At the end of the ceremony, she was asked to offer flowers at the feet of Buddha. In a voice choked with emotions, Swamiji told her, 'Go thou and follow Him, who was born and gave his life for others five hundred times before he attained the vision of the Buddha. He gifted her statue of Buddha. After the ceremony was over, he told her to repeat 'Vahe Guru ki fateh'. Nivedita noted down in her diary 'The day of the Days'. This incident brings out the universal, spiritual and inclusive aspect of Hindu Dharma. 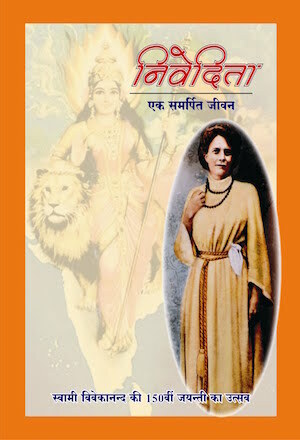 Swami Vivekananda never told Nivedita to worship only Shiva or Buddha. Nor he told her that she should stop praying to Jesus Christ. Ishwara who is infinite and pervades everything cannot be limited to one name or form. The real spiritual person sees God everywhere. He is not exclusive. In tribal regions, this can be seen very clearly. If a person is converted to Christianity, he is told not to worship and even despise his traditional Gods and Goddesses. But if the same person goes to temple he is not told any such things. He is free to worship there and worship his traditional Gods and Goddesses too. May be that is why the intelligent, thoughtful and spiritual aspirant Margaret Noble a daughter of Christian preacher chose to get initiated into Hindu Dharma. Your sweet X'mas note was too lovely. As for the poem—I have no words which to express it, It is head and shoulders over other years — and I do hope you won't forget to send me the card. Swami has not yet started for Europe—but Mrs. Bull and Miss MacLeod have. They will be in London early in February till the 21st and you must call. They know you both well already. I hope you will also meet them at Brantwood. I am just on tenterhooks to feel that they have had a glorious reception from my friends, for they have been angels of love and goodness to me. Swami is at a health-resort up the river. Health said to be much the same. Miss Muller has severed all connections with the Movement, and calls this "giving up Hinduism and returning with joy to X'tianity." It was news to me that any of us had yet left X'tianity. The monks have given a delightful proof of character. I have not heard an unkind word from one of them about her--and she has done all she could to give publicity to her new attitude. I think I told you already that my work was receiving no financial support from her anyway. So there is no consequence in this, for me—I mean in that way. When I sit down to write to you I want hours to write in, but for many weeks now I have been sacrificing everything to the story of our summer which I have been writing for Mrs. Bull and Miss MacLeod. I feel sure they will let you see it when it is ready—if I can get it to London in time—and I know that will be better than letters. They will bring photographs also of Sri Ramakrishna's widow—who looks upon all of us as her "Children" and sends her blessings, but this photograph is not for general distribution. So don't refer to it first! It is her birthday today. I never was able to answer your political warning. I was broken-hearted about Mr. Beatty's attitude. I thought he cared for justice first and the last. Anyway, some of you must help me to get this matter noticed, and for the rest dear Nell, I am not going to take any violent steps. My work is here for the present, as you ll say, and of course I never thought of throwing it up suddenly. Perhaps I said outrageous things-perhaps I was wrong to talk of "politics" at all, but somehow or other I feel sure it will be given to me to utter the deep, heart-felt feeling and meaning of our English nation and sooner or later my work will be recognised as real "politics". I don't mean my 'dame's school' as Miss Muller call it, but my work is going down into the heart and meaning of the people and interpreting it as must be the result. This all sounds just as absurd to me as to you, but it won't prove so. If not the action, then the reaction, will be political. I agree that I have no ability for the game of politics, but the real movers of forces are not gambles,they are sincere and earnest to the core. About my paper. Thank you so much for all your kind encouragement. Mr. Sturdy said I should find myself receiving so many impressions of England in India shortly that I would be sorry to give publicity to my first. I am of course receiving new impressions, but not with this result so far. I think perhaps as a general impression those observations were fairly correct. As time goes on, I shall differentiate between classes of English in India – making special studies of Army, Civilian and Mercantile Groups, So far, my best impressions come from the last. How egoistical all this sounds, and perhaps it is really only breathless. I am so pleased to hear of your seeing so much of the Beattys. Max Mulller's life of Sri R. K. is just out. They say it will sell like wild fire in India. I am finding great riches in Bengali. If Mr. Hammond would learn it he would make his fortune by translations. I have undertaken a play. I can not understand why we have never heard of these things. From all accounts this play would stand comparison with Iben's "Brand". Is it that the only English who learn Bengali are officials and Missionaries, and has not a single member of these class ever had the wit to interest himself in the literature of the people? I can not believe this! Have you read Havelock Elli's "Affimations"? It looks glorious. A Hindu friend showed me a copy the other evening. Oh what a country this is! Talk about strong character! Some day I will write you a letter giving you charaterisations of people I have met. Against the monotonous, collective-coloured background of these community-houses and unlettered women, you get every now and then a horridly-painted individuality which is like a romance – and always always the expression is in religion. So far I have not been able to find anything that I could satisfy myself was honest fetish-worship at heart, but as Brhmo samaj people all assure me that India is "Idolatrous" I will e'en a little longer to be sure. So glad you are going to know Mrs. Bull. Happy New Year. To view this discussion on the web, visit https://groups.google.com/d/msgid/daily-katha/cfa990a8-c45a-dd24-9f0c-d6c5963f2bf2%40vkendra.org. Vivekananda could see the past and future of his disciple and acknowledged the intensity of her aspiration. But the realization demanded neither mere change of place nor exchange of objects, but a transformation, a metamorphosis. And transformation is always in the 'I.' We judge people by their works, but thought precedes work, and awareness precedes thought. The content and intensity of this awareness renders power to the thought and these energized thoughts inspire actions. Consecration, if real and life-long, has to stand on the bed-rock of authenticity. It is not just the polishing of the exterior; expressed in the majesty of our works and the fineness of our words. Every brick of the personality structure—from the inner awareness to its subtle percolation in daily action—is to be trained. Thus discipline, deconditioning and the essential rewiring are inevitable. Vivekananda slashed down all personal affection, 'only in order to bestow the Impersonal vision in its place.' Slowly, Nivedita found that her self-identity metamorphosed into selfless being. And from such natural renunciation came the ability to work in conjunction with the divine will. Magnificent vast objects naturally still the mind and uproot the little ego. The loftiness of the Himalayan peaks had been the haven of Vedic seers and sages. Nature in itself is a shrine. One evening in the pristine precincts of the Himalayan peaks, Nivedita felt an awakening within. She penned it down, "Long, long ago Sri Ramakrishna had told his disciples that the day would come when his beloved Naren would manifest his great gift of bestowing knowledge with a touch. That evening at Almora, I proved the truth of his prophecy. For alone in meditation I found myself gazing deep into an infinite good to the recognition of which no egoistic reasoning had led me..." Her vision cleared, she took note, "I am learning...that there is a certain definite quality which may be called spirituality...that nothing that I have ever called nobility or unselfishness was anything but the feeblest and most sordid of qualities compared to the fierce light of real selflessness. It is strange that it has taken so long to make me see these elementary truths clearly." A life of complete dedication is the result of a transcendental touch somewhere in the soul. Stepping into a higher state of awareness brought its own vision, its own luminosity and understanding. Meditation now became a habit with Nivedita. And in its depths, she found the rationale of her dedication. The 'fierce light of real selflessness' was nothing but the calm resignation of the ego to the Self. When the ego is no longer active in posing and pretence, the Self is able to manifest. When the Self is able to manifest, life becomes one of determined higher purpose—a saga of consecration, a chronicle of devotion. Nivedita's personality was suffused with a divine glow. Having lost itself, the ego made way for the integration of the best values of life. The silence of the east and the energy that characterized the west conjoined in Nivedita's frame. Herself charged she came to Kolkata and found shelter close to a veritable powerhouse. Nivedita came to live with Holy Mother Sri Sarada Devi in the winter of 1898. In Mother's house at 10/2 Bosepara Lane, she lived gracefully imbibing her first impressions of orthodox Hindu life. Onlookers were surprised at what they saw. Many a time they found Nivedita take a mat and kiss it over and over again and then dust it with great care before it was spread on the floor. Mother would sit on it and so the extreme care! 'I never saw a face so full of love' was Nivedita's acute discernment of Mother. She saw in Mother what everyone saw, but which none could fully articulate. A commingling of womanly virtue, immaculate purity and incredible love radiated from those eyes, leaving no doubt that Mother was the visible embodiment of divine motherhood. The calmness and consistency of her demeanor revealed the bright light of Self-knowledge. Compelled and thrilled, Nivedita penned these immortal words which come close to a complete description of Mother, "A yearning love that can never refuse us; a benediction that forever abides with us; a presence from which we cannot grow away; a heart in which we are always safe; sweetness unfathomed, bond unbreakable, holiness without a shadow—all these indeed and more is motherhood." Holy Mother recognized in Nivedita the soul of a goddess and would endearingly call her 'Khuki'—daughter. She watched with pride Nivedita's growing intuitions. In fact, Mother's complete acceptance of Nivedita, in the midst of her orthodox setting, is another turning point in Indian history which made the work for women possible in an unexpected way. As if by divine design, it combined the best of the east and west thus making way for an enlightened global civilization. Nivedita went on to play a major role in Mother's movement. The school she started, which Mother inaugurated, became the nucleus of the Sarada movement and cradled its biggest, independent, women's monastic organization—Sri Sarada Math and the Ramakrishna Sarada Mission. Touched by light and nourished by nectar, the butterfly flutters about radiating the joy of life. As it darts from flower to flower, it gives us the message of freedom—the freedom to change and better ourselves, to rise above our circumstances, to effect the transformations that truly matter. The making of a butterfly is nature's magnificent act of metamorphosis, executed silently, to teach us that change is always within oneself. Change is an unfolding from within, not an imposition from without. This means we are never at the mercy of a world 'out there'.Everything is indubitably entwined with our consciousness which is fully laden with the equipment required for every change. And once the metamorphosis takes place, we may take wing into a life of complete freedom. 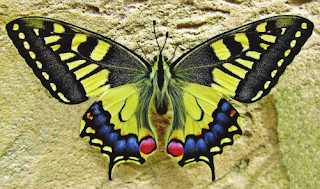 One of the most entrancing of changes, carefully fortified by nature, is the creation of a butterfly. 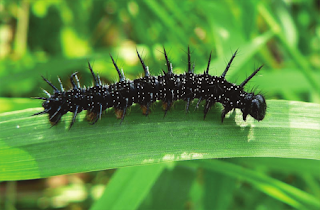 An ugly stout caterpillar, builds a cocoon and transforms it's life energies, little by little, in an unimaginable way, into one of the most beautiful creatures on our planet. As the myriad coloured, brightly winged, delicate butterfly takes wings and soars towards the blue sky, one cannot but wonder whence this transformation? All the lessons that God intended to teach us are enshrouded in the nature around us. If we are willing to learn,there are lessons in leaves and messages in the dew that glistens on them. Learning is Metamorphosis. A very interesting part of learning is questioning oneself. We, humans, have a unique way of deluding ourselves with a permanent sense of identity; until we question the 'I' in all its bareness. When somebody truly does, he is in for a real shocker. Human identity is a defining feature of the human experience. No other creature has a sense of 'I' or self as strong as we do. Man values his relationships, his affections and possessions because of their connections to his 'I'. But how true is the 'I'? A cursory look at the mind, which radiates the sense of being, shows something of the nature of a movie show. The movie is part documentary (based on memory), part drama (based on desire), with a sprinkling of fantasy, comedy and fiction, all collaged together by the ego which poses as the leading actor. And so we sport many identities and remain absorbed in our images and ego-ties. Questioning the ego, peering into its nature, snaps the absorption in the images, for there cannot be a movie without a leading character, and this disrupts the show. The mind comes out of its absorption and becomes conscious of itself. Control becomes possible. Atmavichar or self-analysis thus serves as a key to genuine transformation. In human beings, the self-awareness has come full circle and hence holds the potential to manifest itself fully. That is why the sense of I, the fringe of our true Being, is so strong. With a little analysis we can see that the sense of 'I' has two levels. One is the thinkable portion. It is usually the epithets, appellations and labels we have collected over time. It forms the crust of our personality. More fundamental to this is the feel of existence, without thought. Now, here we have an interesting find. We do remain over, even when we are not thinking. When scrutinized this is a state of simple, intense self-awareness. It is completely independent of our mental cogitation. It is also independent of effort. No process of knowledge is involved in it. In fact it is more 'felt' when the mind is absolutely non-functional, as for instance, during periods of tranquility, in the still hours of dawn and dusk. It steals upon us unawares. The refreshing touch of no-thought and the underlying, flowing, unbroken awareness mesmerizes us occasionally. This experience is fairly common in young people. Meditation is an attempt to consciously and categorically usher in this state and then intensify it. It is plumbing into one's own depths; bringing one's whole being into full awareness. It can be achieved by training attention, which is nothing but a spark of consciousness, arising at will and illumining the objects it falls upon. This makes meditation a cutting-edge spiritual technology to plumb into the depths of our personality structure. Transformation is always transformation of 'I.' Neither change of place, nor method, nor religion actually transforms unless our sense of 'I' has changed. In 1898 Nivedita accompanied Vivekananda to Almora. She had left a comfortable life and an illustrious career, in other words snapped the ties of 'I,' to realize the truths that her Master spoke of. In his wonderful personality she saw a selflessness and purity that were astounding. Initially she did not know what to make of it. Once shorn of the little self, the truth behind the 'I' resurrects itself. When one touches the magnificent reality of one's true Being, the murky ego which is always unsure of itself, surrenders and submits or rather acknowledges its non-existence. This is the basis of all true 'selflessness' for the Self reigns over the ego. And hence a spiritual person radiates a dignity that redefines the conventional attitude of respect. Nivedita saw this clearly in the firm character of her great Guru Vivekananda. She saw how indeed a true sannyasin stands at the head of the Vedas. Her worship of the person now transmuted into selfless dedication to his cause. Margaret spoke, 'You have the ingenuity of 6000 years of conservatism. But yours is a conservation of the people who have, through that long period, been able to preserve the greatest spiritual treasures of the world; and it is for this reason that I have come to India, to serve her with one burning passion for service. ...One day Europe, weighed down by the burden of its riches, might turn toward India envying its poverty and discovering the quality of its incorruptible spiritual treasure. …I must learn everything like a child; my education is beginning. Help me! When the road is difficult, I shall remember the welcome in your kindly faces….' When the speech was over the people warmly responded her. Swami Vivekananda was also pleased with her speech as he could see that she had come to India really to serve and not to patronize it. After getting settled down, Swami Vivekananda wanted Margaret to meet Holy Mother Sri Sarada Devi, the spiritual consort of Sri Ramakrishna Paramahamsa the Guru of Swami Vivekananda. He knew that Margaret would receive something of a shock when she saw the intimate household of an orthodox Hindu widow. He wanted his disciple to feel the sparkling joy that radiated from Sarada Devi. Along with the other two American women, Margaret went to meet Sri Ma on 17th March. Somewhere it was in her mind that, 'if Sri Sarada Devi does not approve of me then it would be difficult to be accepted in India'. It was a very new world for her. The men including Swami Vivekananda and other monks had no entry in the inner parts of Sri Ma's household. On an extremely foggy morning, Margaret left for India by a ship named as 'Mombasa'. Her mother, sister, brother and few friends had come to see her off. Mother and sister could not control their tears. The ship started sailing and as her people and the land of birth started receding in background her Karmabhoomi Bharat started occupying her mind. She was going there depending on the people of India. There was no organization behind her to support her or any financial support. The only person known to her was her Guru. Imagine what must be her thoughts. The co-passengers were no less surprised. Some even tried to frighten Margaret. Someone told, 'You must take care day and night. In India, there is danger everywhere, in the water, which slowly kills, in the fruits, which poison, and in the flowers which intoxicate. It is a strange country where it is more serious to inflict the slightest injury on a cow, a monkey, or a peacock than to murder a man'. However, she was undeterred. She was longing to realize the truth of life, she was eager to offer herself to serve the people of her Master. Nevertheless, how those people would take to her? She had no idea. Margaret's ship reached Calcutta on 28 January 1898. When she saw Swami Vivekananda was there to welcome her along with other monks she felt assured. One of the monks garlanded her. Margaret was overwhelmed with the welcome by so many persons, by such diversity of colours all around and yet blending in some unique harmony. First time she saw so many brown people wearing various dresses and colourful turbans. Margaret walked as if in a dream. That night she wrote a single line in her diary, 'Victory! I am in India'. India was going to witness a very rare sight, a healing touch, Margaret Noble coming to India to serve Indians in Indian way and to learn from India. Initially, her staying arrangements were made in a mansion in Chowringhee, the areas where the British lived. Later two more disciples of Swami Vivekananda Josephine Macleod and Mrs. Bull who had come from America for few months visit were to join her. 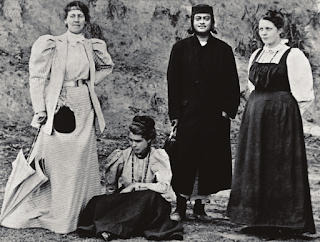 During the Swamiji's first American tour, these two women had made plans to visit their instructor's country, but he had tried to dissuade them. "Come by all means if you want to see poverty, degradation, filth, and men in rags who speak of God and who live only for God. But if you seek anything else, don't come," he said, and added, "We cannot bear one more word of criticism!" Now, four years later, he had himself invited them to come to India. During first few days Margaret was taken for some sight-seeing along with few British friends but her interests lay in seeing Hindu quarters and thus whenever time permitted she would hire a buggy and drove through Hindu quarters which after some time was going to be her permanent abode. Her Bengali lessons also were started immediately. Ever since the day he wrote "Kali the Mother", he has been growing more and more absorbed, and at last he went off quietly without any one knowing, from the place where he was living to a Sacred Spring called Kir Bhowanie. There he stayed eight days, which seem almost too holy to write about. He must have had awful experiences spiritually and physically, for he came back one afternoon, with his face all radiant—talking of the Mother and saying he was going to Calcutta at once. Since then we have hardly seen him. He has been alone and living like a child "on the lap of the Mother"—it was his own expression. How am I to tell you of things that [ ••• ] But I want you to know it as if you had been here. I know you won't treat it as news or as anything but sacred to yourself. My own feeling (mind that is all) is that the ascetic impulse has come upon him overwhelmingly and that he may never visit the West or even teach again. Nothing would surprise one less than his taking the vow of silence and withdrawing forever. But perhaps the truth is, that in his case this would not be strength, but self indulgence and I can imagine that he will rise even above this mood and become a great spring of healing and knowledge to the world. Only all the carelessness and combativeness and pleasure-seeking have gone out of life and he speaks and replies to a question with the greatness and gentleness of a soul as large as the universe, all bruised and anguished, yet all Love. To say anything to him seems sacrilege and curiously enough the only language that does not seen unworthy of his Presence is a joke or a witty story—at which we all laugh. For the rest—one's very breath is hushed at the holiness of every moment. Can I tell you more ? The last words I heard him say were "Swamiji is dead and gone" and again, "there is bliss in torture." He has no harsh word for anyone. In such vastness of mood Christ was crucified. Again he said, he had had to go through every word of his poem of "Kali the Mother" in his experience,—and yesterday he made me repeat bits of it to him. He talked, and because he talked of the Mother, the words seemed large enough. Before he had gone away he left one filled with the Presence of the Mother. Yesterday, he made me catch my breath and call him "God." We are one part of a rhythm, you and I, that is larger than we know of—God make us worthy of our place. "Mother is flying kites", he sang, "in the market place of the world, in a hundred thousand. She cuts the strings of one or two." "We are children playing in the dust, blinded by the glitter of dust in our eyes." He turned to us Sunday and said, "These images of the Gods are more than can be explained by solar myths and nature myths. They are visions seen by true Bhakti. They are real." श्री हेवेल ने कला संबंधी अपने अनुभव बताते हुए कहा, "....मैं एक व्यक्ति को चित्र खींचना तथा चित्रकारी करना सिखा सकता हूं परंतु मैं उसे कलाकार नहीं बना सकता हूं। क्योंकि कलाकार अंतर्मन की साधना से बनता है। चित्रकार चित्र में आंसू बहाती स्त्री को तो बना सकता है, किंतु उसमें स्त्री के मन की पीड़ा और दर्द को व्यक्त नहीं कर सकता। एक सफल कलाकार जो अंतर्मन में उस दर्द को आत्मसात किए हो वही उसे प्रभावपूर्वक चित्र में प्रस्तुत कर सकता है।"
भगिनी निवेदिता तुरंत बोली, "ठीक इसी प्रकार देश के लिए, समाज के लिए प्रेम, जन्म के लिए स्वाभिमान, भविष्य के लिए आशा तथा भारत के लिए अगाध श्रद्धा आश्चर्यकारी कार्य करवा सकती है। आवश्यकता है भीतर से आस्था की।"
One day Swami Vivekananda turned to Margaret and said that, 'I have got great plans for educating the women of my country. I think you would be of great help in it." These words had a great impact on her. She felt it was this call for which she has been waiting. Yet, she was a strong person and did not want to take any decision being sentimental. Thus, she thought over it again and again. She had that sincerity of purpose so as she felt the call in her deep within she decided to go to India and imbibe Indian spirituality while serving the people of her Master. Margaret Noble wrote to Swami Vivekananda saying that she would like to come to India to serve the Indians and to imbibe the Indian spirituality. Again, Swamiji was not a person who would say immediately yes to it. He had his own ideas about a non-Indian working in India. He did not want a person to come and impose his ideas on the people. Secondly, he was also concerned that how Margaret could cope up in a hot weather of India without any adequate facilities. He wrote to her that she could very well serve India by being in London itself. However, Margaret had decided to jump, to offer herself and so there was not holding back. Thus, she wrote again to Swamiji that she wanted to come to India. Swami Vivekananda recounted four difficulties. He told Margaret that India was a fearfully hot country and she would have to put up with it. Secondly, she would not get any European comfort could she live without it. The British may not take it lightly if she is working for Indians can she stand their dislike and fourthly the Indians may also doubt her good intentions she being a British citizen, can she bear it? However, Margaret was determined to come to India. Swami Vivekananda permitted her and assured in these words that he would stand by her, "On my part, I promise you that I will stand by you unto death, whether you work for India or not, whether you give up Vedanta or remain in it." Margaret Noble thus decided to go to India leaving her bright career as an eminent educationist in London. Many might have considered this as madness in her country. But what a great choice it was – sacrifice over career? Just imagine if she would have continued in England she would have lived and died as a well-known educationist but she sacrificed her life for India and even today in this far off land from her land of birth, people are fondly remembering her contribution and celebrating her 150th Birth Anniversary. Really, her life emphasizes this that there is no greater qualification than the sincerity of purpose and so greater career than sacrifice for the sake of higher purpose. ... 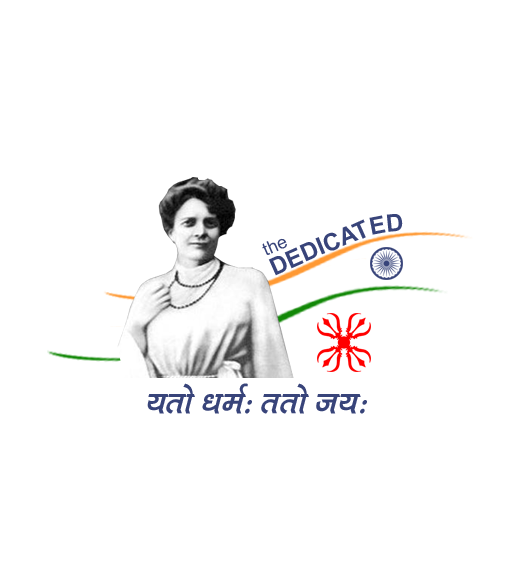 In a short stay in India of about 14 years, between 1897 and 1911, Nivedita made lasting contribution to the major fields of national action that defined the early nationalist movement. Be it national education, be it the Swadeshi art and industrial movement, be it sustaining the revolutionary movement or providing succour to the revolutionary nationalists, be it supporting Indian scientific research as she did in the case of Acharya Jagadish Chandra Bose, ensuring that he continues with his path-breaking research and stands up to British, read colonial hegemony, and prove the point of Indian capacities in science and scientific research, Nivedita's imprint is hard to ignore, especially, if one were to disengage oneself from dialectical lenses while studying this phase of India's evolution. The complete marginalisation of her contribution by the "mainstream" academia and intelligentsia is understandable though. Direct, forthright, unabashed and unrepentant when it came to India and India's interests, image and welfare, it is extremely difficult to stereotype Nivedita into categories. One who was so intricately and intrinsically identified with India's civilisational aspirations, one who so eagerly embraced the Hindu way of life, one who so minutely detailed the civilisational contributions of Hinduism — both in terms of history and religion, her Cradle Tales of Hinduism, Footfalls of Indian History and especially Kali the Mother was staple read once upon a time all over Bengal and other parts of India, while making a great impact abroad in countering false propaganda against the Indian way of life — could not be stereotyped — it was plain impossible. Nivedita's descriptions of the various facets of our national life caught the essence, the spirit as it were, of our core civilisational construct, identity and expression. She was wholly accepted and absorbed in India, her stay in the "native" quarter of Calcutta, her project of a girl's school in the area, her efforts to create and evolve a national discourse on all issues and subjects that strengthened India's quest for self-hood was not only welcomed but saw genuine and unstinted supported from the people. ​So at ease and so accepted was she that Nivedita could easily speak at the temple of Kalighat on Kali and describe her centrality in the evolution of Indian religious experience. For her, India never need be apologetic — this same uncompromising nationalism saw her take on missionary calumny against India on foreign shores. One who simply said, when asked what she would do in India that "My life is given to India. In it I shall live and die", or who, in her daily aspiration meant for nationalists wrote thus, "I believe that India is one, indissoluble, indivisible" and that "National unity is built on the common home, the common interest and common love" and that the "strength which spoke in the Vedas and Upanishads, in the making of religion and empires, in the learning of scholars, and the meditation of the saints, is born once more amongst, and its name today is nationality" and one who believed that "the present of India is deep-rooted in her past, and that before her shines a glorious future", can hardly be compartmentalised while also being unmanageable for a large section of our self-anointed intellectual-guardians and conscience-keepers who have always worked to negate the India of the past altogether. Above all, perhaps had it not been for Nivedita, we would not have discovered that Vivekananda which even the most conscientious biographer fails to capture. Who else but Nivedita, herself profoundly and unalterably identified with Bharat, could have written about the master thus, "There was one thing however, deep in the master's nature, that he himself never knew how to adjust. This was his love of his country and his resentment at her suffering. Throughout those years in which I saw him almost daily, the thought of India was to him like the air he breathed." As we inch towards her 150th birth anniversary one would do well to recognise, re-evaluate her life and work and to rekindle a deeper and wider interest in Sister Nivedita. That would, in a sense, be a tribute of gratefulness to her as Lokmata. The Sahitya Akademi award for literary excellence in the Bengali language in 1978 went to Sankari Prasad Basu (1928-2014) for his multi-volume opus on Swami Vivekananda's life and times — Vivekananda O Samakalin Bharatbarsha. In each of the seven volumes Basu, primarily a professor of literature in the University of Calcutta, poured a wealth of information hitherto unknown, on the various dimension of the Swami's life. After an exhausting and often lonely research trudge — lightened only by the labour and kindness of the monks of the Ramakrishna Mission and a large number of ordinary people who were driven to action whenever told that this unassuming professor of literature was in fact 'Swamiji's' biographer and was travelling the length and breadth of the country to unravel and discover all possible documents and leads that could shed more light on the master himself. Once the volumes began appearing, they created a wave in Bengal and in the Bengali literary circles, generating not only a great interest in the Swami's life but also giving rise to a multi-dimensional debate on the various angles and interpretations that the author made. Yet, Basu's opus was never translated into other Indian languages or into English so that it could reach a larger audience both at home and abroad. Even on his death, Basu was largely forgotten by Akademi stalwarts, despite making such a seminal and epochal contribution to India's cultural history. He was not, as they say, well-connected and rarely cared to visit the hallowed zones of the national capital and never bothered to kowtow to political power and prestige. Moreover Basu refrained or rather could not sing paeans to the political masters and thus could not ingratiate or enrich himself in any way. But Basu per se is not the object of discussion in this column; rather it is the principal personalities around whom his work and life revolved. Apart from writing a detailed multi-volume biography of Vivekananda, Basu's another lasting contribution, and one which continues to remain unparalleled, was his multi-volume biography of Sister Nivedita (1867-1911) — Nivedita Lokmata — which immortalised in much greater detail than Lizelle Raymond did — Nivedita's life and contribution to India's quest for self-expression — cultural, educational and political. In fact, had it not been for Basu and later for Pravrajika Atmaprana, the story of the Lokmata — one who had inspired scores of Indian leaders from the Lokmanya to the Deshbandhu, to Sri Aurobindo and Gurudev — would have remained untold, unrecorded and forgotten. It was Rabindranath Tagore who conferred the epithet of 'Lokmata' on Nivedita and Basu picked it up and immortalised it in his four volume biography of this Irish catholic turned Hindu, disciple of Swami Vivekananda. But unfortunately, as is the habit with a class of our intellectuals and institutions they control — Nivedita's contribution to the creation of the "idea of India", or her corpus of work on as varied and intricate subjects as cultural history, education, civic nationalism, cleanliness, women education and empowerment, art, historiography, religious and dharmic debates, Swadeshi and much more remain largely unexplored or unfathomed. 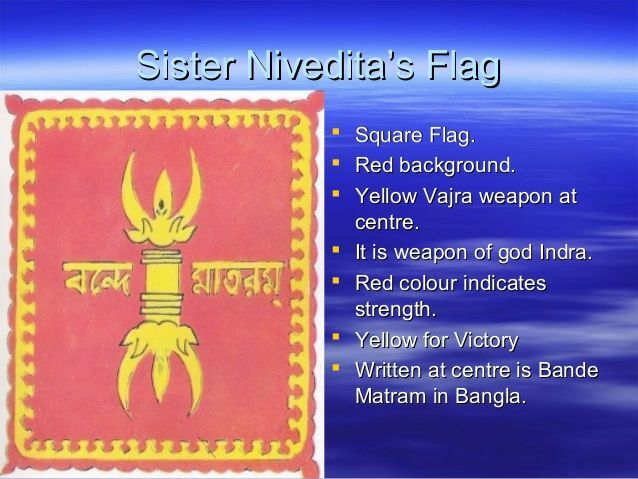 It is unknown, for example, that in 1906, it was she who designed a prototype of the national flag with the 'vajra' at the centre and wrote a detailed exposition of the centrality and power of that symbol both in Hinduism and Buddhism. Her significance for the 'vajra' was striking: "The selfless man is the thunderbolt" for national action. It was that lighting like selflessness which needed to be cultivated among workers of Indian freedom. Nivedita herself often embodied that thunder-like presence, imbued from her master — her father as she often called Swami Vivekananda.